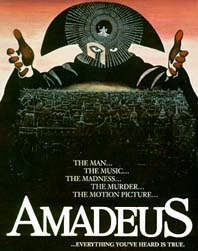 The jealous Salieri (Abraham), a mediocre composer, plots to do in the prodigy Mozart (Hulce). With Elizabeth Berridge, Roy Dotrice, Christine Ebersole and Simon Callow. Saul Zaentz ( - ). Zaentz's other works include: ONE FLEW OVER THE CUKOO'S NEST (the Best Picture of 1975).